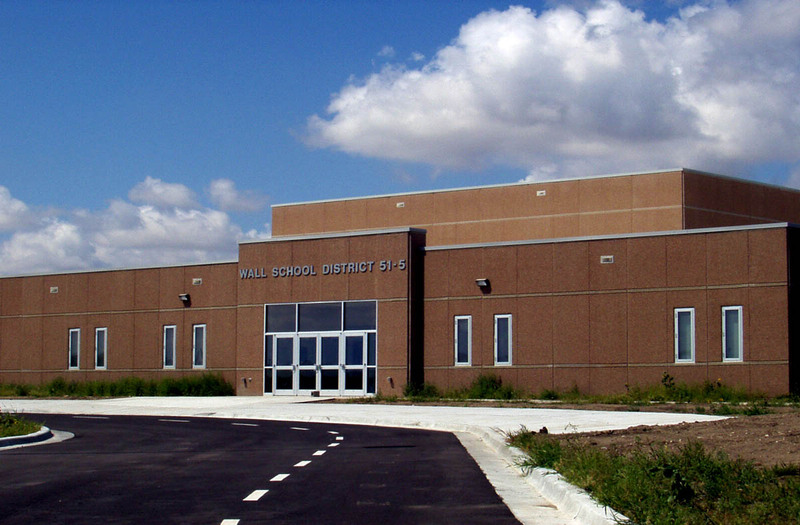 West Plains Engineering provided mechanical and electrical design services for the Wall K-12 School. The school is approximately 58,000 square feet, which includes new classrooms, science rooms, computer labs, library, administration areas, kitchen area, Vo-Ag shop, an 11,000 square foot gymnasium and locker/shower areas and a 3,900 square foot music/multi-purpose room. The project included a geothermal heat pump system consisting of 108 vertical wells that provides the heat sink, heat pumps, and air-to-air heat exchangers providing both heating and cooling to the facility. The electrical service required two separate services to take advantage of electric rate savings provided by West River Electric. One service is dedicated to heating only. The other service feeds all non-heating loads such as energy efficient lighting, kitchen equipment, Vo-Ag equipment, computers and various other loads.